Marianne linked this up at her blog! So glad I saw it! I need to decorate some eggs this week, and there is a very cool challenge going on at the Hero Arts blog - to stamp on something non-paper!!!!! This is so beautiful! Love the idea. Oh wow, what a great idea!!! I need to try this! Oh my GOSH - these are amazing!! TFS!! These are nothing short of a masterpiece. So beautiful and fun! Oh My! These are just beautiful eggs. What a great idea...I will have to try this out with my nephew and niece!! These are simply wonderful! True works of art! Stunning! Once again, you have created a masterpiece! Oh ELLEN! These are amazing! I love them - I have some serious trigger finger with my spray gun - so mine would look like the Easter bunny ate the candy, had a sugar buzz and went WOOOO WOOOO with the spritzing! LOL! Oh my gosh...those are beautiful!! These are fabulous. 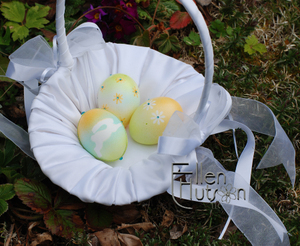 I just ordered an airbrush and what an inexpensive palette to work on...EGGS! 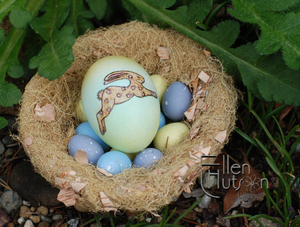 Thanks you for sharing your art with us Ellen...They are EGGstraordinary! Ellen these are so beautiful. What a family treasure. Oh WOW! These eggs are AMAZING!!! !